there is a question i get asked sometimes on here: “how and when did you know jay was the one God had chosen for you?” so i thought i would write a little on it. i never really dated. i mean, i went to homecoming when i was thirteen or fourteen with a guy i had a “crush” on but i’m not sure if that counts. there seemed to be a lot of people my age who would date, have some fun and fall in “love” then break up. the cycle would continue and end in heartbreak. i saw many broken hearts and i didn’t really want that. after reading many leslie ludy books like “when God writes your love story“, i realized that the Lord had a man who would one day become my husband. until then, i would focus my attention and energy on seeking Jesus and the will that He had for my life. i didn’t want to date someone if i didn’t see myself marrying them. if i could go back to my high school years and even after i wish i would have been bold and encouraged others to do the same. i saw a lot of broken hearts and crummy relationships. let me clarify: dating is not wrong, it really isn’t. but many young woman date just to date. obviously i dated jay before we were engaged. 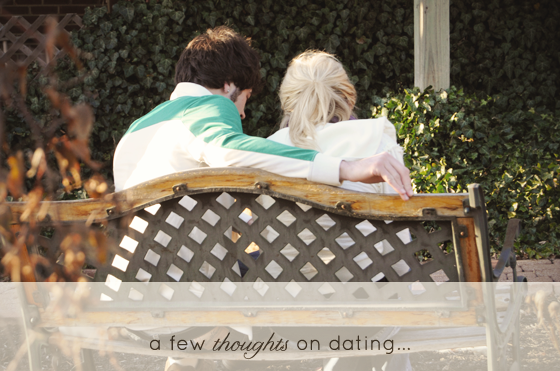 it is the motive behind dating that is most important. anywho, on to if jay was the “the one.” when i met jay, i was at a time in my life where i had given over my love life to the Lord. i got tired, real quick about thinking of my future husband or boyfriend. i wanted to live in the present and didn’t want to have my mind focused on “what if’s.” of course, i admit, when i was at coffee houses or out and saw a guy that looked interesting i would think “hmmm…maybe he is…” (i mean, c’mon haven’t you done that? see a nice guy and wonder if he’s the one. i know you’ve done that sort of thing!) but really, i wasn’t looking for anyone to date. i was still waiting. i came to a place in this journey where i was ok with the thought of being single for life and becoming a missionary in india. there were certain guy friends in my life at the time who wanted to pursue our relationship more and i was still not sure i was ready to do that. then jay came along and things changed. i really liked jay…he was unique and i saw something different in him. i prayed a lot and talked to some people about jay. my grandpa was one of those people. my mom was another. i was waiting to hear an audible voice come down from heaven saying “HE IS THE ONE” but no voice ever came. what did come though was time and seeing jay’s heart. i saw the way that He sought the Lord. i saw his humility and patience. the way he treated me was exactly the way i knew the Lord would have my future husband treat me. he had a great sense of humor and lightheartedness about him that i loved. he was also very out-going…something that my shy, introverted self lacked. after some time, some heart-searching, and after he asked my dad’s permission to date me, we moved forward. so, how do you know if HE is the one? the thing is, you might not know right away. you will a have peace about it. and peace is much different than attraction. you will have people around you that love you and will encourage you in the relationship. if everyone around you is telling you the relationship is a bad idea, it probably is. truth be told, love can be blind. so keep seeking Jesus. keep seeking His heart and He will give you a peace and be the center of your relationship. your to-be husband that the Lord has for you will lead you. he will be the leader in your relationship. both spiritually and physically. goodness…this is so “spot-on”! quite possibly one of my favorite posts of yours! :) i think this is something that, even those of us who are in a relationship or engaged(! ), struggle with. i’ve learned that we over-complicate things so much regarding whether “he’s the one”…sometimes you have to just be simple and sensible, knowing that “the one” isn’t going to be perfect, meet all of your expectations or fulfill all of your needs (only Jesus can do that!). at least for me in my relationship with my fiance, i had to come to a point where i had to choose between continually seeking perfection and all of these useless “qualities” in him (does it really matter whether or not he likes to take road trips like me all the time? ), and accepting him for what he is and was created to be. it’s a scary moment…knowing that you’ve surrendered “looking” elsewhere, but it’s so comforting knowing that you’re with “the one” God hand-picked for you! Arielle thank you for that encouragement!! I am 24 and have never been on a proper date! :) Thank you for the encouragement to cling even more to God! I was on the brink of tears reading this post. I definitely have not “embraced” my singleness. I’m in the waiting stage and finding it very difficult to be patient when I see friends and family, everyone who close to me, with their special someones. I just want that for myself so badly. However, like you said, now is the time to focus my full attention on the Lord. Twice now, your posts (the clothing one and now this) have been spot on with what I needed to hear and to be taught. It’s difficult to listen though. Thanks so much for sharing, Arielle. It’s been a true blessing to have found your blog. this is such a beautiful post. growing up, and in high school, i never really dated. i had never met someone i wanted to share my life with, someone i felt comfortable around. it was so strange to me that everyone around me seemed to be “falling in love” with someone new every other day! i never understood that. and then last year, i met my current boyfriend, The One. i’m so glad i waited for this man to tell my stories to, share my life with. PS i’d just like to add that even though i’m not religious and we don’t share the same religious beliefs, i always find such inspiration in your writing and in your stories. i think that’s a really amazing thing. I love this, Arielle! So much truth. this was so wonderful & encouraging to read. i honestly have been kicking myself lately for turning away a friend who wanted to pursue more. but reading what you wrote about having a peace was exactly what i needed to hear. it makes perfect sense…and i am very convinced that i was not given that peace in this situation for a reason, even if its not always clear. thank you for this. I wish so much that I had waited to date. I was not a believer and didn’t understand why you wouldn’t date. It caused me much pain. I’m so glad your story is different. You are blessed! Thank you for sharing. Wow. I really LOVE reading your blog. You have such great insight! I like what you said about seeking God’s will for you and having a feeling of peace about the relationship (that is truly how I felt when dating my husband…it was very different than in other relationships I had been in before him). Thanks for sharing these thoughts. Thanks for the encouragement! I’m finding it tough to enjoy my singleness but I’ll do my best to embrace it for all it’s worth because I know that God will bring the right man into my life when the time is right. Thanks again! Love this! I also love Leslie Ludy and the book “the first 90 days of marriage.” I briefly read “I kissed dating goodbye,” which was interesting, but I read it while I was already dating Vance and ended up marrying him, so it wasn’t as meaningful fo me! “you will never get that time back in your life” – so true! i think all too often people forget this and then, after never really being single and rushing into marriage, they realize somewhere down the line that they “missed out on” being single. so – well said! Arielle, this post is amazing! It makes me feel so lucky and grateful for my boyfriend! I’m such a brat huh? Thanks for tolerating me and always being so kind and responding. I really am a mess though. Wonderful post. I feel the exact same way about dating. I am still in highschool, and it is very difficult to maintain such a belief when everyone around is doing the complete opposite. It is hard to be patient. Thanks for this post. Girl, I wish we were friends in high school!! I could have really used this truth! But, thank you so much for sharing now & I hope that you are able to continue to be a picture of Jesus & encouragement to many. I honestly wish I had thought to enjoy my singleness when I was single. All my friends were in relationships and I envied them so I was miserable. When I met Dustin, my husband, I knew almost right away that he was it and that made me happy. And although I would never ever trade him for anything I truly wish I’d really gone nuts before he and I settled down! Beautiful! What wonderful insight. So much of falling in love is about following your heart and trusting in God’s plan for you. Having Jesus as the center of your relationship is vital to experiencing a lasting and forever love! I enjoy your blog so much. So much of what you write about is how I think. You are very encouraging and super adorable. You have a very adorable family too. Once I started reading your posts I got hooked. I now follow your blog and look forward to you posting new ones. They make my day :0). Thanks for using your God giving gift so well. Be blessed and I’ll keep checking back for more updates! Amen and Amen! I would definitely say I didn’t know at first but I did recieve that peace. God is so good! Loved reading this! You have such wisdom in your youth! I can say that, as I’m not so youthful anymore ;). I too wish I had embraced singleness more but I am thankful for my husband and that I waited on God to bring him to me. “Peace” would definitely describe the feeling I had when I met my man and we began the path toward marriage. We will celebrate 17 years this summer. Wow! The time has flown by, we’ve had our difficulties but I wouldn’t trade it or him. I love him more today than 17 years ago. Love definitely grows if we weed, water and feed it. How true these words are! Before I met my husband, I spent many years running head first into relationships I thought were a good idea, never bothering to stop and think about whether they were part of God’s will for my life or not. NONE of them turned out well. It wasn’t until I let go and let Him take the reigns of my life that I met my husband. When we started dating, it was such an eye opener to me. All the guys I had pursued in the past were ones I thought had what I needed. Turns out God knew better, and had picked someone out for me that would meet my needs, and make me a better person in ways I had never imagined. As soon as we started dating, I knew that this relationship was different. That feeling of peace you described is so right on- that’s EXACTLY what I felt. I so hope that many girls read this, and heed your words. It will spare so many broken hearts and unfulfilling relationships! I really love reading your blog, it never fails to remind me of the Lord’s goodness and I’ve truly been blessed and encouraged by your posts. When I was in high school, most of my close friends were dating, and dating became something that I felt was quite “cool”. I had went through several relationships, none of them lasted for more than a year. I never had the thought of marrying the guy whom I was dating. True enough, when the relationship is not God-centred and ordained by God, it wouldn’t be blessed. I dated a guy whom my family, church and friends disapproved of. But I was so blinded by “love” that I decided to go my way. Yet, the relationship ended up with broken hearts and pain. I told myself that I should never get into a relationship in the near future. But God had his own timing for things to happen. Within a year, the right guy appeared. I have been dating him for more than 3 years now and we’re planning for marriage within the next few years. I totally agree with your post that we should wait for God to place the right guy in our life in His own timing instead of trying to go through the cycle of getting into a relationship and then breaking up. It would have been great if I would have understood this truth years before. Only having become a Christian at 18, I sometimes envy stories like yours. Praise the Lord for rescuing us and keeping us [albeit in different ways]. Your story is beautiful. I love, love, loved that book by Leslie & Eric Ludy. It completely changed my heart and my perspective on dating. I didn’t know right away that my husband was “the one” either, but it was definitely a different feeling and a different kind of attraction (if that’s even the right word for it) when we started to get to know one another. Our stories, our history, our upbringing…all matched. It was almost uncanny how similar we were. But when I knew, I just knew. Beautiful story. Thank you for sharing it with us! Arielle thank you so much for posting this today. It was a God-thing that I read it. I am sitting here (if I can be so honest) bawling my eyes out. I am heart broken right now, as my boyfriend of long time and I just got into a huge fight and quite possibly broke up. You are so right.. “keep seeking Jesus.” that is essential. Jesus knows whats best and Jesus knows who I am going to end up with. I love your heart. Thank you again for sharing this. That’s so true, Arielle. Thank you for posting this. It’s something I needed to hear for quite a long time. I met Jeremy in our Christian high school when I was only 16. Neither of us have a lot of experience in the dating world, so I always like to read about other people’s experiences. Girls today need to hear more from people like you than what’s promoted in popular culture. God is so faithful isn’t He? He knew just the kind of men we needed! I love this post. I need to do my very own like this. Before my husband & I started dating, I did some heavy praying on whether or not I should pursue something more with Scott. One night when I was pondering over it, God literally sent a rainbow . . . when I was in one of the parks where he & I had been with friends a week or so earlier. Aw friend, your last paragraph really spoke to me as I’ve been desiring to be married already. I tell myself I’ve been single for long enough and sometimes question why we (bf and I) aren’t married yet, so thank you. I think this is so true, not only for dating, but for all areas of our lives. We can get caught up in trying to do it our way and forget to realize that God’s plan is much greater than the plans we have for ourselves. Thanks for the reminder! your words here are so true encouraging. i just want to echo all the other comments by thank you for posting this and encouraging me to continue on my wait and resting on God for the one he has for me. You just brought me to tears…goosebumps beautiful!!!!! Thank you Jesus for such amazing inspiration & words. Wow, so close to heart, so special. You have a new follower!!!! have a look at my blog too if you’d like. thank you for the encouragement emily :) many blessings! thank you so much emily….i pray that the Lord will bring you comfort. i hope you are doing ok…i’m sure it’ not easy. keep seeing Him, lovely! yes, i loved the book also! definitely changed my perspective :) how awesome! thank you so much gabrielle…what a beautiful & redemptive story! many blessings to you both & may He bless your relationship! 17 years! how awesome :) that is so great to look up to! i feel like after 10 (sometimes 5…3) years of marriage people give up so easily! you are too funny! i’m excited to see when the Lord will bring you the guy He has for you..
you two will do great things for the kingdom!! keep seeing Him girl….your light shines. thank you kristin…i too, was too shy to say anything to many of my friends who were in relationships in the past. This is beautiful. I lead a 8th grade girls small group through my church and we were just talking about this idea last week, so I shared the link to this post with them. I SO appreciate your beautiful honesty and encouragement in this! © 2018 Arielle Elise Photography |ProPhoto Photographer Site | Designed by That's Kinda Cool!